I was actually working with another attorney when I filed a complaint for modification in 2014 to get joint physical custody of my daughter. I found my attorney to be completely disorganized, dishonest and difficult to work with. My now wife was deposed by the Defendant and was advised to have an attorney present for the deposition. My wife stayed up all night emailing various practices explaining the situation and that she needed an attorney that following week. Marcia responded to my wife’s desperate email in the middle of the night which now knowing Marcia so well is not uncharacteristic. Marcia quickly caught herself up to speed with the case, made time to prep with my wife and managed her through the deposition. After my wife describing Marcia as professional, articulate and efficient, I made the decision to hire her for my case. We hired Marcia in December 2014 and worked with her through our trial in August 2016. In that time, we had several unforeseen circumstances that forced the case to get pushed back. When we first started working with her, she managed our expectations and was very realistic which I found was not as common as you would think when speaking with attorneys. She was very straightforward yet compassionate to my case. She genuinely cared about my family as did her team. Never having gone through litigation, I didn’t know what to expect. Her team was patient and provided guidance on how to handle certain situations (requests from opposing counsel and dealing with my daughter’s mother to name a few) which at times was above and beyond. Having this case become longer than expected, my wife and I become emotionally drained and Marcia and her team helped us stay the course. They were extremely organized, detailed and what appeared to always be ahead of the opposing counsel at all times. I was always able to reach someone on her team and each member of her staff displayed a standard of professionalism. This in particular was refreshing given I had worked with two practices who were so disorganized. We suspected this case would go to trial and wasn’t sure how Marcia would do with litigation. Not surprising, Marcia was just as good in the courtroom as she was outside the courtroom. So good that the judge commented at the end of our trial on how well we were represented. She was well known in our court (Norfolk) and had worked with our particular Judge before which I think was valuable to our case. She also worked well with the opposing counsel which I also think was a real benefit in our case as there was a lot of back and forth over the years. At the end of the day, results are what matters. We received our consolidated judgement and rationale in late October 2016 from our trial. Every item that we wanted modified was changed. An extra bonus was that my child support was lowered. We had a very practical judge which certainly helped this case but I think it came down to the way that I and my daughter’s mother represented ourselves. He stressed the desire to hear from us. Without Marcia’s guidance, I don’t know if it would have went as well as it did. My daughter’s mother got up on the stand and just attacked me as a parent. Marcia reminded me to focus on what was important, remain respectful and complimentary (anyone going through this will agree is not always easy, especially after being attacked) to her mother. I did that and in the Judge’s rationale he stressed the fact that our parenting styles may be different but that our daughter will benefit from both of us. She continued to highlight the fact that co-parenting should be flexible and harmonious and that even after we get through this litigation, we are still parents and have to deal with one another. I realized I would be better off taking the high road and now that it is over, I am glad I did. I can’t thank Marcia and her team enough for their work on this case as I now get to enjoy my daughter’s childhood which is a finite time in a child’s life. Thank you to everyone on the Mavrides Law team for all of your hard work and diligence. The case went as well as we could have hoped today in court. Judge Casey approved the proposed judgment and the "irretrievable breakdown" language. I am very grateful to be freed from this marriage legally in the U.S. , and to be able to keep my own assets. Getting her belongings and jewelry back to her will no doubt be complicated, as will securing a divorce in India, and handling the apparent criminal charges they've filed on my parents and me in India. But this was a really important step and one which carries a lot of weight with regard to future ones. My ex-wife had sent a letter to the judge and he had read it. But it appears he knew and trusted Marcia, and approved what she and all of you had put forth on my behalf. Your firm's ethical standards are likely well-known to the judges who hear your cases; I imagine these standards, your detailed preparation, and intelligent strategies go a long way in your successes with your clients. Thanks again to each of you-- Jennifer, Alana, Christina and Marcia-- for your excellent work on this case. Marcia Mavrides and her Boston Legal team were true professionals in handling my divorce in Massachusetts. The divorce process itself was extremely overwhelming and emotional, but having the best Boston divorce attorney and practice in my corner gave me the confidence that I would get everything I deserved and needed to move on with my life. After 6 months of back and forth non-sense from my ex and her attorney, Marcia Mavrides was finally able to get them to settle in court, before even going to trial. Not only did I get everything I wanted in my divorce settlement, but Mavrides Law saved me the extra money by not having to prepare and go to trial. I can't thank Marcia and everyone at Mavrides Law enough for getting my life back on track!!! I'm SO HAPPY after my experience working with Attorney Mavrides and her Boston Legal staff. My only regret is that they were my second choice! I was referred by a colleague to another Boston divorce attorney to handle the divorce of my 25 year marriage. BIG mistake.... After 7 months of working with my prior Boston divorce attorney, 5 trips to court and a meeting with a conciliator, the parties were still unable to reach an agreement on any of the issues. My old Boston divorce attorney was spinning her wheels and not getting anywhere. I knew it was time to find a new divorce lawyer in Boston. I read about Attorney Mavrides and had a feeling she was the right divorce lawyer for me. After my first meeting with her and her associates I felt extremely confident in my decision to retain her. She is brilliant! After listening to my case she knew exactly what needed to be done to bring the matter of my divorce to a closure. She explained what her plan of action was and what was needed to execute it. She came through with everything we discussed. In 3 months my divorced was finalized. Working with her and her associates was a pleasure. They were knowledgable, very efficient and friendly. They took a lot of the stress out of a stressful situation. The divorce attorneys at The Law Offices of Marcia Mavrides are amazing and the best divorce lawyers! They were able to help me get closure on that chapter of my life and I am now able to move forward onto the next chapter of my life. After having failed to establish equal custody with my x-wife through mediation and meeting with two other Boston divorce lawyers, that assumed the court would not order equal custody of my four year old son to me, I was given no rationale to why. Luckily, I was fortunate enough to come across MAVRIDES Law, listed under "child custody lawyer" on AAVO. I first made contact with MAVRIDES Law via email and explained my goal of securing equal custody of my son. Within 24 hours Marcia Mavrides responded and gave me the confidence to continue my pursuit which eventually lead to me meeting Marcia and Jennifer Silva. We discussed my case and, although neither Marcia nor Jennifer could confirm the outcome at the time, I felt comfortable and confident that I had finally identified a legal team that was compassionate with my goal of securing equal access to my son. I was also confident that Marcia, Jennifer and the team were competent in representing me. Marcia and her team established that Jennifer Silva would be my child custody lawyer and manage communication with my x-wifes lawyer and represent me in court. From our first meeting through the final divorce, Jennifer established our goals and set expectations, clearly advised me on the law, kept communications lines open and was very responsive to questions or concerns I had going through the process. In court, and with opposing counsel, Jennifer was a professional, direct and relentless child custody lawyer in her pursuit to help me secure equal custody of my son, and also negotiated a settlement that helped us avoid trial and further unnecessary time in court and costs. Thank you Marcia, Jennifer and team for helping me accomplish my mission when others in your profession did not believe the court would allow a father equal custody of his child. Contemplating divorce, I asked several friends for the best Boston divorce attorney. Marcia Mavrides came HIGHLY recommended. To say I was completely satisfied with the representation Marcia and her Boston Legal team provided throughout my divorce is an understatement. From my intial consultation with Mavrides Law several years ago, I immediately knew I was speaking with the best Boston divorce attorney. I remenber after explainning my situiation and reviewing some of the financial statements ect. Marcia said to me " you seem professional, well prepared and organized". Let me tell you about myself. I am very good at what I do and I only handle family law. You are in good hands". Married 20 years with 3 children , divorce is a diffiult decision . When it was time to start the divorce process, I knew where to go . Throughout the whole process we were on the same page .. I was always well informed on issues and /or progress. Marcia Mavrides always had my best intrest at hand. I had heard many nightmare stories of what happens to fathers in Massachusetts divorce court. I was reassured by Marcia I would be OK. Durring the whole process the team kept an agressive pace to get the end and we did successfully. I am very happy with the outcome. I have refered Marcia in the recent past and will continue to do so. I am very grateful I found the best Boston divorce attorney. Truely professional, considerate and understanding. Thanks to Mavrides Law, "LIFE IS GOOD" again. Marcia Mavrides and her Boston Legal team were excellent. I was not confident in how my case was going and sought a second opinion with Mavrides Law to address my concerns. During this consultation, Marcia and I reviewed many issues/open questions and Mavrides Law presented a well laid out plan for how she would move forward if she were my attorney. I was extremely impressed with her professionalism and clear knowledge of all aspects of family law. I retained Mavrides Law shortly after that. Marcia exceeded the expectations set in our initial consultation. In the end, my decision to move forward with Mavrides Law paid tremendous dividends. Marcia was aggressive with opposing counsel when the situation called for it. Marcia was persuasive when she needed to be persuasive. Marcia's results in court were superb. Marcia and team gave extra attention when I was not comfortable with or unsure of what to expect during the process. It goes without saying that Marcia leverages her 30 years of experience in all aspects of her practice and the results show. Marcia runs a first-class operation. Her team is tremendous. I would not hesitate to recommend Mavrides Law firm. It's with GREAT PLEASURE that I write this review. I've been working with Mavrides Law since my initial consultation back in December of 2011. From my first conversation with Marcia, I knew the connection we made was one that was first and foremost all about my daughter's future. She spent over an hour with me on the call, to learn about my specific situation, and her knowledge of Family Law in Massachusetts was evident from the beginning. If you're going to fight for shared parenting, you need the best Family Law lawyer! When it comes to Family Law knowledge... Everything Marcia or Jennifer explained would happen throughout this arduous/emotional/frustrating process happened like clock work. Their advice was always in the best interest of my daughter. They were candid and blunt about what to expect and put things plainly so that I can make the best possible decision for my daughter. Fast forward 1 yr and 4 months from when I actually retained their services. I've recently been blessed and awarded 50% shared custody (legal & physical) of my daughter, and that was all due to not only their firms experience, but also to the dedicated team they have assembled at Mavrides Law. Marcia & Jennifer were diligent, hard working, empathetic, and just plain awesome to work with throughout this process....Working with them together was like working with a pitcher/catcher duo that is unmatched. I couldn't be more blessed to have connected with them both. If ever I need anything regarding Family Law again, Mavrides Law is on my speed dial: plain and simple. Their support team, Alana and Liz were also incredible to work with. Always pleasant, professional, and just all around great people. It's apparent that everyone at Mavrides Law is all about the children...Really, they are! In closing, while I don't wish the custody battle process on anyone, if you are ever faced with the decision to hire a Family Law attorney in Massachusetts, Mavrides Law should be on your list of first options. My step father use to say to me, you get what you pay for, and while Mavrides Law may not be the least expensive firm out there, Mavrides Law is worth their weight in Gold. My daughter and I are forever indebted to them all! During this very difficult time in my life, I knew my divorce was being handled properly and I was in good hands with Mavrides Law as my divorce lawyer in Massachusetts. It was one less thing about which to worry. I knew Jennifer, of Mavrides Law, had my best interest at heart and trusted her during the process. She was a pleasure to work with and I highly recommend Jennifer as a divorce lawyer. Marcia Mavrides and her associate divorce attorneys assisted me on my child custody & child support case for over a year. Marcia is the second attorney I hired for this case and I felt so grateful & lucky that I chose Mavrides Law. She and her team analyzed my child custody & child support case in detail, they were always there when I needed them. In addition, Marcia is very knowledgeable and has lots of professional experience which helped her to think about ways of helping me out on my case. When I got divorced, I agreed to accept minimal child support from my daughter's mother without knowing that the amount was way below the Mass Gov Guideline. My daughter's Mother filed a complaint for getting child custody back and requesting child support from me and asking for amount according to the Mass Guideline. With Marcia's help, I was able to settle without paying child support. I really appreciate Marcia's professional and all her hardwork. I would recommend Marcia to anyone who need help on child support. Marcia Mavrides and her entire staff. are consummate professionals. Immediately, I felt that I was in capable hands. Marcia took the time to learn about me and my family dynamic which provided a most complete divorce agreement. Her knowledge of Family Law in Massachusetts and attention to detail truly set her apart. Whenever I had a question or concern, it was always addressed in a timely and thorough manner. Marcia took it upon herself to advocate for me and my children with compassion and fortitude. She took the stress out of an extremely stressful situation, and I cannot thank her enough. Without reservation, I continue to highly recommend Marcia Mavrides for all your legal needs regarding Family Law in Massachusetts. It is with great pleasure that I write this recommendation for Mavrides Law firm. I am breathing a sigh of relief now as my divorce was granted after a two year struggle. I originally went to another lawyer, and got some really bad advice and made some really bad steps in the proceedings the he insisted that I do. I had very limited options which felt like I was being extorted to pay a high settlement amount. I decided that I needed a second opinion on the case as I lacked total confidence in that attorney. As such, I hadn't slept for nights and I was very worried. When I spoke to Marcia for the second opinion my stress was all eliminated. She "grabbed the bull by the horns" and made sure that I was treated fairly through all of it. Her strategy throughout the entire process was absolutely rock solid. Fast forward 18 months, and in court the judge wanted to grant me damages for my ex-wife's non-compliance and opposing counsel did not have a leg to stand on. She blew opposing counsels plan out of the water at the last minute. She then tactically navigated and negotiated the settlement to where It was fair for all involved. She made sure that she had all supporting documentation and her preparation was incredible. My divorce was particularly difficult because we were dealing across two very different countries and cultures, and her ability to see my perspective was truly a God send. We talked about several different scenarios and as the time progressed I felt very confident in how things would turn out. She was extremely fair in her billing for everything she did. I want to Thank Marcia, Jennifer, and the entire team at Mavrides Law Firm for getting my life back to normal. Marcia Mavrides has been the most supportive and informative divorce attorney with which I have had the pleasure of working. I was confident that she knew how to get the most from my case and work with my family and our needs. If I ever need assistance from a divorce attorney in the future, I will most certainly contact Marcia and will always refer her to family and friends. She is the best! Marcia Mavrides and her associates were outstanding in representing my side of a divorce case, and the final judgment was favorable for me. In looking for an attorney I sought someone who was experienced, highly competent, and yet also someone who I found trustworthy and who cared about the details of my case. This is not as easy a combination to find in one divorce lawyer in Massachusetts as one might think. Her office did meticulous research on my case and was highly responsive to inquiries and feedback. Her fees were reasonable and more than commensurate with the work done. I totally recommend Mavrides Law without reservation to anyone who needs a divorce lawyer to represent himself or herself. In my Massachusetts child custody case, Marcia Mavrides represented me in a professional, compassionate manner which put me at ease upon our very first meeting. She understood and respected my need to put the children first, and defended me against bogus allegation, after bogus allegation of "Parental Alienation". Marcia took the time to learn each small detail of my case which added up to the big picture. She and Jennifer kept me informed every step of the way with constant communication and explanation for what was to happen and what to expect. Marcia is a well prepared, skilled negotiator, who thoroughly knows the Massachusetts child custody laws. She works hard to exhaust every effort to negotiate and resolve conflicts in order to stay out of the courtroom. Yet she possesses the confidence and toughness to move forward with proceedings when necessary. I highly recommend Marcia and her Associates for any Massachusetts child custody case. She will work endlessly on your behalf, and it feels great to have her on your side. She just gets it! Attorney Marcia Mavrides was a calm and common-sense presence during the most difficult time of my life: my marriage annulment. She and her staff were compassionate and knowledgeable, always helping me feel like I was the one making the decisions, but with the benefit of their professional input. I am very grateful for the help provided by her and her office, and I highly recommend them for anyone needing a marriage annulment. I knew that Massachusetts's law coupled with some complications within my own case would be a challenge that I could not just bring to any Massachusetts Family Law practice. I needed a team that could advocate for a Father, who was out of state, and who could empathize with my situation on a personal level by getting to know me. I interviewed many Massachusetts Family Law practices, who seemed cold and, frankly, just interested in taking my money, not hearing about my individual needs. My research brought me to Mavrides Law, and I have to say that, of all the decisions in my 42 years, the choice to go with this firm was one of the best I have ever made. From the beginning, Attorney Mavrides was knowledgeable of Massachusetts Family Law, my rights and how they would incorporate into Massachusetts's law. She possesses a gentle candor that makes you feel at ease, but also keeps your expectations realistic. It was that approach from the beginning that made me realize that she was not just prepared to champion my cause, but more importantly the cause of what was fair and right for my children. Attorney Mavrides and her staff, partner attorneys as well as administrative help, were aggressive, available and responsive to each and every concern that I had, no matter when I called. (Many times on the weekends and late at night) I was never treated as a hassle or inconvenience. When it was imperative to me to get a question answered, it was imperative to them as well. Being in Maryland, and seeking parenting time with a co-parent who was uncooperative and out of State proved challenging, but my Attorneys kept me sane through the process. I would not have maintained my patience without this team, which I realize now, would have only jeopardized my case. They worked diligently for me, and now I have a set schedule with no questions about when, where and how I will see my boys each and every month. I get to look forward to the Holidays this year, and that is priceless. I can't thank them with words or actions for the peace of mind that their practice has afforded me. When you are looking for a Massachusetts Family Law Attorney, in a child custody case, your consideration has to encompass experience, dedication and empathy from the entire staff, and I got that and more from this group. I am grateful for their tenacity and commitment to my case. It's nice to know that I have advocates States away, and should complications arise, I have the full confidence to say that for me there is no other Law firm that I would trust. My Massachusetts divorce attorney, Jennifer, of Mavrides Law, provided expert advice through an extremely stressful process. She gave me the courage to forge ahead, when I would not have on my own. I would not hesitate to recommend her, and Mavrides Law, to anyone who needs a Massachusetts divorce attorney. It was a pleasure to work with Katie, of Mavrides Law, our Family Law attorney in Boston. She was professional, well prepared and kept the focus on the facts of our case. We were pleased with the outcome and would highly recommend ms. Kerr. to everyone who needs a Family Law attorney in Boston. For several years I represented myself in a protracted legal dispute, hoping to save time and money by not hiring a Boston Family Law attorney. The result was a series of judicial decisions that contradicted both the letter and the spirit of the legal document in question, and required ongoing outlays of significant sums of money on my part. I recently hired Boston Family Law attorney, Marcia Mavrides, to help me resolve the matter. She knew the law, she knew the judge, and she knew which pressure points would help nudge the other party toward a settlement far more favorable than I could have achieved on my own. I recommend Marcia without reservation for her legal expertise, her courtroom tactics, her negotiating acumen, and her knowledge of human nature. My only regret is that I did not hire her years ago. Thank you and your expert team (Katie Kerr, in particular) for representing me in my recent Divorce Modification case. I could not have asked for more competent representation and a better outcome. The outcome was a direct result of the professionalism, proficiency, efficiency and effectiveness of you and your team. As we walked through the court building, it was easy to see the respect you have earned with your peers, court officers and judges. I'm sure this is largely due to your easy-going, friendly and professional manner. You have a great way with people, and as a client, this is very reassuring. You have a profound strategic ability and displayed great judgment at just the right times. Indeed you showed an uncanny ability to think quickly on your feet with very little input. You were always very well prepared and produced well documented, articulate and comprehensive arguments in your court memorandums. Quite honestly, I believe this was a significant reason our opposition came to the table so quickly to negotiate. Lastly, and perhaps most importantly, I greatly admire your toughness, sense of fairness and unyielding sense of ethics. I'm sure these traits are what have gotten you to where you are and will serve you well in the future. A client could ask for nothing more. I am eternally grateful you were on my side (and not opposing counsel) and that you worked so hard and diligently on my behalf. Thank you! I whole heartedly recommend Mavrides Law for any divorce modification case in Massachusetts. Best wishes for continued success, and if there is anything I can do for you in the future, please do not hesitate to call. Mavrides Law: I want to let you know I was very pleased with the courtesy and professionalism of your Boston Legal team and definitely would recommend your Boston Family Law firm to anyone who is looking for a headache free divorce lawyer in Boston. Thanks again! A Father. . . Finally. Thanks to Marcia Mavrides, my daughter Eva is part of my life. More importantly, I am a part of her life, growth, development, and rearing each week. Marcia Mavrides is the best child custody lawyer in Boston! I will forever be disappointed that Eva's Mother deprived me of even modest and/or reasonable interactions with my daughter during our daughter's first two years of life. YET, I WILL BE FOREVER GRATEFUL to Marcia and her team at Mavrides Law, whom in the end: reunited me with my daughter just after her second birthday. Aside from being a probate "Ninja," Marcia Mavrides is equitable, compassionate, and often fun to watch. Oftentimes, Marcia and I found ourselves in Court on Mondays at 8:30 a.m. On each instance (however frivolous), either she or her associate Jennifer was there. And while not always apparent to me (at the time), Marcia's ethical, reasonable, and logical arguments, as well as her clear advocacy for "the best interest of my child" either carried the day or laid the requisite groundwork to do so in the future. The greatest moment I ever witnessed -- and I watch Law & Order every day -- was early on, when my ex-wife, ex-wife's attorney, Marcia and I had a 4-way meeting. For the initial 15 minutes, my ex-wife's attorney proceeded to slander me, and introduce incomplete facts. Marcia just nodded and made notations on her legal pad. After my ex-wife's attorney had introduced all of her alleged "evidence," Marcia proceeded to SYSTEMATICALLY DISMANTLE everything. Each point, rules of evidence, inadmissible, hearsay, the word I learned that day was "QUASH." This is how I quickly discovered that Marcia Mavrides IS the best child custody lawyer in Boston! It got to the point where my ex-wife's attorney (in her own office mind you) was refusing to answer, much the less parry, ANY OF Marcia's questions and/or respective interrogations. Yet it was likely during those moments of Marcia's thumping, that I ultimately realized that "giving the wheel over to Marcia" was the right decision. Most likely, divorce will be the worst experience of your life. If you have children, remove the "most likely" and expect the worst - particularly if you are a Dad in Massachusetts. Every divorced Dad, I spoke to said: "just give up!" But regardless of the odds, I had to be able to look my daughter in the eye (and myself in the mirror) and know for certain that I did everything possible. You don't really get a second chance! Thanks to Marcia's guidance, each weekend that I spend with my daughter obviates what to most may seem like a the Pyrrhic Victory. Finally, I never once felt as though any of Mavrides Law's invoices were EVER inflated or unreasonable. Furthermore, while Marica is the guru, I quickly discovered that two of her associates, Jennifer + Katie were great as well. Marcia has a proficient and dedicated team. Frequently, at 6 p.m. on a Friday night -- when expecting to leave a message -- either Jennifer or Katie would answer my call. I would be pleasantly surprised and I have come to realize that such efforts are why Marcia and her team are so successful. If you want the best child custody lawyer in Boston, you've got to go with Marcia Mavrides! I am writing you this letter to thank you and, in particular Katie Kerr, for her outstanding job with my divorce. Katie followed up every detail and ensured the settlement of my divorce was fair and equitable. I initially feared being taken advantage of by now former wife through the legal process. But, to my surprise, it did not happen. Katie did an excellent job, protecting my rights and what remained of my assets. I am a professional making well into the six figures, and I can sleep at night, now that it is over and justice was served, and it only happened ,because of her gift of fact finding and care to details. Marcia, I will always recommend your team and of course your star, Katie Kerr, to all of my colleagues when the need arises. 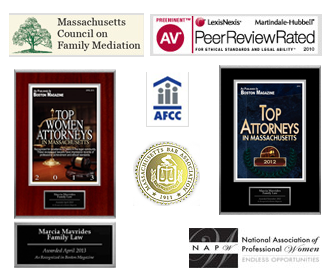 Marcia J. Mavrides is the best divorce attorney in Boston! She's the master of her field, loves her work, and treats her clients with caring respect that inspires trust and confidence. Professional, ethical, experienced, fair-minded--Marcia is the best of the best.